King Tut This annual is a ‘Proven Winners’ plant. 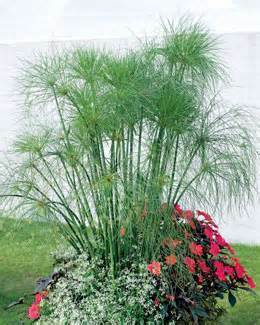 King Tut is a large growing Cyperus that commands a dramatic presence as a Thriller in larger container plantings. It will grow from 4' to 6' tall and from 30" to 36" wide. It has long green stems that will be topped with feathery green umbels. King Tut is a graceful specimen in containers or the landscape. Plant King Tut in full sun to partial sun and give it plenty of water as this is an aquatic plant. You can also plant this specimen next to ponds or even in the water itself as it loves water.